Who knew that China spends $100 million per year on weather-modification programs? 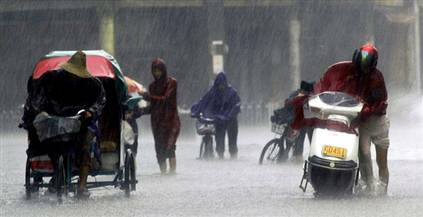 Chinese weather planners intend to use their expertise to reduce the possibility of rainfall for the 2008 Summer Olympics in Beijing. If storms approach the city, Chinese authorities will seed the clouds with silver iodide to force rainfall; Beijing weather patterns make it clear that your chances of getting wet while watching track and field are about fifty percent. If the statistics are to be believed (and are not just part of some sort of "Five Year Plan" for rain), Chinese weather-controllers (1,500 strong!) know what they are doing. Since 1999, 250 billion tons of rain have been created and 470,000 square kilometers of land have been made hail-free. By 2010, the volume of artificial rain will reach 50 billion tons per year. In China, weather control is nominally the function of the China Meteorological Administration, but since the effort involves planes, anti-aircraft guns and other military paraphernalia, the Chinese navy is also involved. China plans to set up a national command center for weather modification by 2010 to coordinate the practices of rain making and hail-suppression around the country. This is exactly what the government does right here in the United States - the fictional U.S. of Robert Heinlein's 1941 novel Methuselah's Children, that is. The government has weather integrators that direct the movement of storms across the country. At this point in the story, Lazarus Long is trying to land a rather large space freighter (with "worn, obsolescent injection meters," no less) in the middle of a storm that was built to order. Here in real-life America, we have very little control over the weather; experts agree that we are behind the Chinese in weather-control technology. However, we are way ahead in weather as art. From China government weather control and China plans to control weather for Olympics.